Apparently, this isn’t Tetra Tech’s first time at the rodeo. The company currently at the center of a controversy involving an alleged conflict of interest at the EPA’s West Lake Landfill Superfund site has been investigated by federal law enforcement in the past. In 2009, an official of Tetra Tech pleaded guilty to defrauding a client of $2.4 million, according to the FBI. 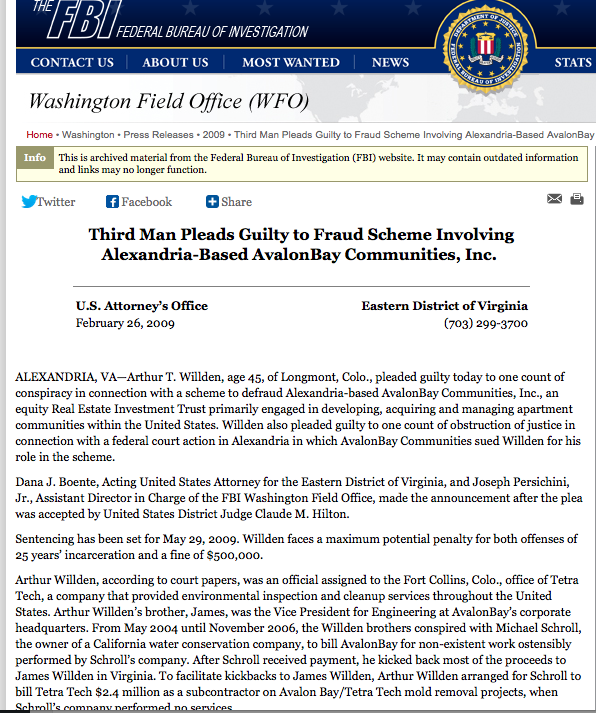 Arthur T. Wilden, who worked at Tetra Tech’s Fort Collins, Col. office, was convicted in federal court in Virginia in February 2009 of masterminding the scam, which involved Wilden’s brother, James Wilden, and Michael Schroll. From 2004 to 2006, the Wildens and Schroll charged a Virginia-based real estate company for environmental testing by a Tetra-Tech subcontractor that was never performed. Tetra Tech has now been hired by EPA Region VII to test for radioactive contamination at homes in Spanish Village, a subdivision near the West Lake Landfill Superfund site. Another Colorado-based company, EMSI, is a longtime contractor for the potentially responsible parties (PRPs) at the at the same EPA Superfund site.